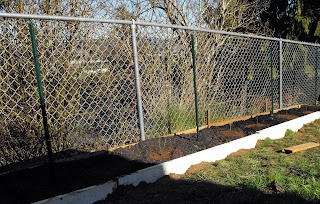 A few weeks ago, the hubby and I built a new raised bed along our back fence and planted raspberry bare-root plants. 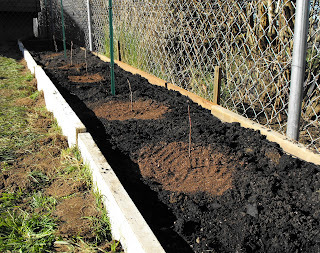 Eight sweet little raspberry starts are happily planted and are already showing signs of life! What a wonderful location for raspberries. I love growing raspberries. First, they provide you will beautiful flowered covered bushes and then tasty fruit. When we move into our "forever home" I want to do more edible landscaping.